A new range of collectible mini Hatchimals are seemingly on the way. 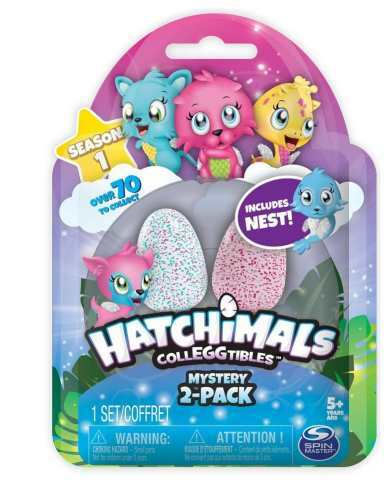 Named Hatchimal CollEGGtibles, we initially spotted them on Amazon Germany which advises a release date of 1st May 2017. With no official press release from the manufacturer Spinmaster it's still not clear what exactly a Colleggtible is, but it looks like some kind of battery operated mini Hatchimal which can be used for playing or collecting. 70 different varieties are promised in the first "Season". 2-pack with 2 Colleggtibles, 1 Nest and 1 overview map. The Eggs measure 4.2cm (Height) x 3.17cm (Width) and require an LR44 battery (included which is a small coin watch type battery). The 2 pack with nest and map is priced at around £11 which would indicate a price point of £5 each. There are no sign as yet of Colleggtibles on any UK retailer websites. As soon as we have more information on UK pre-orders we will add listings to our Hatchimal webpage.